EPIZOLONE-DEPOT 40 mg/1 ml contains 40 mg of Methylprednisolone acetate in 1 ml of Suspension for Injection (40 mg/ml). Macrogol 3350, Myristyl-gamma-picolinium chloride, Sodium chloride, Water for injection. EPIZOLONE-DEPOT is a sterile suspension for injection for single use. Glucocorticoids should only be considered as symptomatic treatment, unless in case of some endocrine disorders, where they are used as a substitution treatment. Methylprednisolone acetate (EPIZOLONE-DEPOT) is not suitable for the treatment of acute life- threatening conditions. If a rapid hormonal effect of maximum intensity is required, the I.V. administration of a highly soluble glucocorticoid agent such as Methylprednisolone sodium succinate is indicated. Bullous dermatitis herpetiformis (Sulfone is the drug of first choice and systemic administration of glucocorticoids is an adjuvant). To induce diuresis or remission of proteinuria in the nephrotic syndrome without uremia, of the idiopathic type or that due to lupus erythematosus. Fulminating or disseminated pulmonary tuberculosis when used concurrently with appropriate antituberculous chemotherapy. Primary or secondary adrenocortical insufficiency. (Hydrocortisone or cortisone is the drug of choice. Synthetic analogues are allowed if used in conjunction with mineralocorticoids where applicable; in infancy, mineralocorticoid supplementation is of particular importance.). Nervous system: acute exacerbations of multiple sclerosis. Localized hypertrophic, infiltrated, inflammatory lesions of: lichen planus, psoriatic plaques, granuloma annulare and lichen simplex chronicus (circumscribed neurodermatitis). EPIZOLONE-DEPOT may also be useful in cystic tumors, aponeurosis or tendinitis (ganglia). - Intra-articular, periarticular, intrabursal or soft tissues. EPIZOLONE-DEPOT should not be administered by any route other than listed in “Therapeutic Indications” section; (see also “Adverse reactions reported with contraindicated routes of administration” in “Warnings and Precautions” section). The Intramuscular Dosage will vary with the severity of the condition being treated. When a prolonged effect is desired, the weekly dose is calculated by multiplying the daily oral dose by 7 and given as a singular intramuscular injection. Dosage must be individualized according to the severity of the disease and response of the patient. In general, the duration of the treatment should be kept as short as possible. Medical surveillance is necessary. For infants and children, the recommended dosage will have to be reduced, but dosage should be governed by the severity of the condition rather than by strict adherence to the ratio indicated by age or body weight. Hormone therapy is adjunct to and not a replacement for conventional therapy. Dosage must be decreased or discontinued gradually when the drug has been administered for more than a few days. Severe medical surveillance is recommended when chronic treatment is discontinued. The severity and expected duration of the disease as well as the reaction of the patient to medication are primary factors in determining dosage. If a period of spontaneous remission occurs in a chronic condition, treatment should be discontinued. Routine laboratory studies, such as urinalysis, two-hour postprandial blood sugar, determination of blood pressure and body weight and a chest X-ray should be made at regular intervals during chronic therapy. Upper GI X-rays are desirable in patients with an ulcer history or significant dyspepsia. In patients with the adrenogenital syndrome, a single intramuscular injection of 40 mg every 2 weeks may be adequate. For maintenance of patients with rheumatoid arthritis, the weekly intramuscular dose will vary from 40 - 120 mg. The usual dosage for patients with dermatologic lesions relieved by systemic corticoid therapy is 40 - 120 mg of methylprednisolone acetate administered intramuscularly for 1 - 4 weeks. In acute severe dermatitis due to poison ivy, relief may result within 8 - 12 hours following intramuscular administration of a single dose of 80 - 120 mg. In chronic contact dermatitis, repeated injections at 5 - 10 day intervals may be necessary. In seborrheic dermatitis, a weekly dose of 80 mg may be adequate to control the condition. Following intramuscular administration of 80 - 120 mg to asthmatic patients, relief may result within 6 - 48 hours and persist for several days to 2 weeks. Similarly, in patients with allergic rhinitis (hay fever) an intramuscular dose of 80 - 120 mg may be followed by relief of coryzal symptoms within 6 hours persisting for several days to 3 weeks. If signs of stress are associated with the condition being treated, the dosage of the suspension should be increased. Therapy with EPIZOLONE-DEPOT does not obviate the need for the conventional measures usually employed. Although this method of treatment will ameliorate symptoms, it is in no sense a cure and the hormone has no effect on the cause of the inflammation. The dose for intra-articular administration depends upon the size of the joint and varies with the severity of the condition in the individual patient. In chronic cases, injections may be repeated at intervals ranging from 1 - 5 or more weeks, depending upon the degree of relief obtained from the initial injection. It is recommended that the anatomy of the joint involved be extensively reviewed before attempting intra-articular injection. In order to obtain an optimal anti-inflammatory effect, it is important that the injection be made into the synovial space. Employing the same sterile technique as for a lumbar puncture, a sterile 20 - 24 gauge needle (on a dry syringe) is quickly inserted into the synovial cavity. Procaine infiltration is elective. The aspiration of only a few drops of joint fluid proves the joint space has been entered by the needle. The injection site for each joint is determined by that location where the synovial cavity is most superficial and most free of large vessels and nerves. With the needle in place, the aspirating syringe is removed and replaced by a second syringe containing the desired amount of EPIZOLONE-DEPOT. A small quantity of synovial fluid is aspirated to make sure the needle is still in the synovial space. After injection, the joint is moved gently a few times to aid mixing of the synovial fluid and the suspension. The site is then covered with a small sterile dressing. Suitable sites for intra-articular injection are: the knee, ankle, wrist, elbow, shoulder, phalangeal and hip joints. It is often difficult to enter the hip joint; precautions should be taken to avoid any large blood vessels in the area. Joints not suitable for injection are those that are anatomically inaccessible, such as: the spinal joints and those like the sacroiliac joints that are devoid of synovial cavity. Treatment failures are most frequently the result of a penetration outside the synovial cavity. Little or no benefit follows injection into surrounding tissue. If failures occur when injections into the synovial space are certain, as determined by aspiration of fluid, repeated injections are usually futile. Local therapy does not alter the underlying disease process, and, whenever possible, should be complemented with physiotherapy and orthopedic correction. The area around the injection site should be cleaned carefully and an infiltration at the site made with 1% procaine hydrochloride solution. A 20 - 24 gauge needle attached to a dry syringe is inserted into the bursa and the fluid aspirated. The needle is left in place and the aspirating syringe changed for a small syringe containing the desired dose. After injection, the needle is withdrawn and a small dressing applied. In the treatment of conditions such as tendinitis or tenosynovitis, care should be taken to inject the suspension into the tendon sheath rather than into the substance of the tendon. The tendon may be readily palpated when placed on a stretch. When treating epicondylitis, the most painful area should be outlined carefully and the suspension infiltrated into the area. For ganglia of the tendon sheaths, the suspension should be injected directly into the cyst. In many cases, a single injection causes a marked decrease in the size of the cyst and may effect disappearance. The usual sterile precautions should be observed, of course, with each injection (application of a suitable antiseptic to the skin). According to the severity of the condition, the dose can range from 4 - 30 mg. In recurrent or chronic conditions, repeated injections may be necessary. Following extensive cleansing with an appropriate antiseptic such as 70% alcohol, 20 - 60 mg of the suspension is injected into the lesion. In case of large lesions, it may be necessary to distribute doses of 20 - 40 mg over repeated local injections. Care should be taken to avoid injection of quantities likely to cause discoloration, since this may be followed by a small necrosis. One to four injections are usually employed. The intervals between injections vary with the type of lesion and the duration of improvement produced by the initial injection. EPIZOLONE-DEPOT in doses of 40 - 120 mg administered as retention enemas or by continuous drip 3 - 7 times weekly, for periods of 2 or more weeks, have been shown to be a useful adjunct in the treatment of some patients with ulcerative colitis. Many patients can be controlled with 40 mg of EPIZOLONE-DEPOT administered in 30 to 300 ml of water. Other accepted therapeutic measures should, of course, be instituted. Intrathecal administration; reports of severe medical events have been associated with this route of administration. Intranasal and ophthalmic administration and diverse places of injection (skull skin, oropharynx, sphenopalatine ganglion). Known hypersensitivity to methylprednisolone acetate or to any of the excipients. Diabetics: Manifestations of latent diabetes mellitus or increased requirements for insulin or oral hypoglycemic agents. Hypertensive patients: Aggravation of arterial hypertension. Patients with psychiatric antecedents: Existing emotional instability or psychotic tendencies may be aggravated by glucocorticoids. Patients with ocular herpes simplex or zoster associated with ocular symptoms: fear of corneal perforation. Routine laboratory studies, such as urinalysis, 2-hour postprandial blood sugar, determination of blood pressure and body weight and a chest X-ray should be made at regular intervals during prolonged therapy. Upper GI X-rays are desirable in patients with an ulcer history or significant dyspepsia. Medical surveillance is recommended in case of discontinuation of a chronic treatment. The possibility of a drug-induced secondary adrenocortical insufficiency can be minimized by a gradual reduction or discontinuation of the dosage. The adrenocortical function should be evaluated after discontinuation of a chronic treatment. The most important symptoms of adrenocortical insufficiency are asthenia, orthostatic hypotension and depression. In order to minimize the incidence of dermal and subdermal atrophy, care must be exercised not to exceed recommended doses. Multiple small injections into the area of the lesion should be made whenever possible. The technique of intra-articular and intramuscular injection should include precautions against injection or leakage into the dermis. Injection into the deltoid muscle should be avoided because of a high incidence of subcutaneous atrophy. In patients on corticosteroid therapy subjected to unusual stress, increased dosage of rapidly acting glucocorticoids before, during and after the stressful situation is indicated. Glucocorticoids may mask some signs of infection, and new infections may appear during their use. There may be decreased resistance and inability to localize infection when glucocorticoids are used. Infections with any pathogen including viral, bacterial, fungal, protozoan or helminthic infections, in any location in the body, may be associated with the use of corticosteroids alone or in combination with other immunosuppressive agents that affect cellular immunity, humoral immunity, or neutrophil action. These infections may be moderate, severe and at times fatal. With increasing doses of corticosteroids, the rate of occurrence of infectious complications increases. Do not use intra-articularly, intrabursally or intratendinously in the presence of acute infection; I.M. administration can only be considered after institution of an appropriate antimicrobial treatment. Administration of vaccines based on live attenuated virus is contraindicated in patients receiving immunosuppressive doses of corticosteroids. Inactivated or biogenetically-produced vaccines may be administered to these patients; however, the response to such vaccines may be diminished or they could even be ineffective. Indicated immunization procedures may be undertaken in patients receiving non-immunosuppressive doses of corticosteroids. The use of EPIZOLONE-DEPOT in active tuberculosis should be restricted to those cases of fulminating or disseminated tuberculosis in which the corticosteroid is used for the management of the disease in conjunction with appropriate antituberculosis regimen. If glucocorticoids are indicated in patients with latent tuberculosis or tuberculin reactivity, close observation is necessary as reactivation of the disease may occur. During prolonged corticosteroid therapy, these patients should receive chemoprophylaxis. Because rare instances of anaphylactic reactions have been reported in patients receiving parenteral corticosteroid therapy, appropriate precautionary measures should be taken prior to administration, especially when the patient has a history of allergy to these drugs. Allergic skin reactions have been reported apparently related to the excipients. Rarely has skin testing demonstrated a reaction to methylprednisolone acetate, per se. Glucocorticoids should be used with caution in non specific ulcerative colitis, if there is a probability of impending perforation, abscess or other pyogenic infection. Caution must also be used in diverticulitis, fresh intestinal anastomoses, active or latent peptic ulcer, renal insufficiency, hypertension, osteoporosis and myasthenia gravis, when steroids are used as direct or adjunctive therapy. Thrombosis including venous thromboembolism has been reported to occur with corticosteroids. As a result, corticosteroids should be used with caution in patients who have or may be predisposed to thromboembolic disorders. No evidence exists showing that glucocorticoids are carcinogenic, mutagenic or impair fertility. Corticotherapy has to be considered when interpreting a whole series of biological tests and parameters (e.g. skin tests, thyroid hormone levels). Hepatobiliary effects: Drug induced liver injury including acute hepatitis or liver enzyme increase can result from cyclical pulsed intravenous methylprednisolone (usually at initial dose ≥ 1 g/day). Rare cases of hepatotoxicity have been reported. The time to onset can be several weeks or longer. In the majority of case reports, resolution of the adverse events has been observed after treatment was discontinued. Therefore, appropriate monitoring is required. Co-treatment with CYP3A inhibitors, including cobicistat-containing products, is expected to increase the risk of systemic side-effects. The combination should be avoided unless the benefit outweighs the increased risk of systemic corticosteroid side-effects, in which case patients should be monitored for systemic corticosteroid side-effects (see Drug Interactions section). In case of intra-articular use and/or other local administration, a strict sterile technique is needed to avoid iatrogen infections. Following intra-articular corticosteroid therapy, care should be taken to avoid overuse of joints in which symptomatic benefit has been obtained. Negligence in this matter may permit an increase in joint deterioration that will more than offset the beneficial effects of the steroid. Unstable joints should not be injected. Repeated intra-articular injection may in some cases result in instability of the joint. X-ray follow-up is suggested in selected cases to detect deterioration. If a local anesthetic is used prior to injection of EPIZOLONE-DEPOT, the anesthetic package insert should be read carefully and all the precautions observed. Intrasynovial injection of a corticosteroid may produce systemic as well as local effects. Appropriate examination of any joint fluid present is necessary to exclude any possible infection. A marked increase in pain accompanied by local swelling, reduction in joint motion, fever and malaise are potential symptoms of suppurative acute arthritis. If this complication occurs and the diagnosis of sepsis is confirmed, local injections of glucocorticoids should be discontinued and appropriate antimicrobial therapy should be instituted. Glucocorticoids should not be injected into unstable joints. Sterile technique is absolutely necessary to prevent infections or contamination. Although controlled clinical trials have shown glucocorticoids to be effective in speeding the resolution of acute exacerbations of multiple sclerosis, they do not show that glucocorticoids affect the ultimate outcome or natural history of the disease. The studies do show that relatively high doses of glucocorticoids are necessary to demonstrate a significant effect. Arachnoiditis, meningitis, paraparesis/paraplegia, sensory disturbances, bowel/bladder dysfunction, headache, seizures. Temporary or permanent visual impairment including blindness; allergic reactions; rhinitis. Temporary or permanent visual impairment including blindness, increased intra-ocular pressure, ocular and peri-ocular inflammation including allergic reactions, infections, residue or slough at injection site. Miscellaneous injection sites (skull skin, oropharynx, sphenopalatine ganglion): blindness. Parenteral drug products should be inspected visually for particulate matter and discoloration prior to administration. A strict sterile technique is needed in order to prevent iatrogen infections. This product is not suitable for I.V. and intrathecal administration and may not be used as a multidose vial. Following administration of the desired dose, any remaining suspension should be discarded. Shake thoroughly to obtain a uniform suspension. 2. Mount the needle on the syringe. 3. Remove needle shield. The syringe is now ready for use. Because of possible physical incompatibilities, EPIZOLONE-DEPOT should not be diluted or mixed with other solutions. By the treatment of fulminating or disseminated pulmonary tuberculosis and tuberculous meningitis with subarachnoid block or impending block, methylprednisolone is used concurrently with appropriate antituberculous chemotherapy. By the treatment of neoplastic diseases like leukemia and lymphoma, methylprednisolone is usually used in conjunction with an alkylating agent, an antimetabolite and a vinca alkaloid. Glucocorticoids may increase renal clearance of salicylates. This could lead to a decrease in salicylate serum levels and to salicylate toxicity when the administration of corticoids is stopped. Macrolides such as erythromycin and ketoconazole may inhibit the metabolism of corticoids. An adaptation of the corticoid dose may be required in order to avoid an overdosage. Protease inhibitors (e.g. ritonavir, indinavir) and pharmacokinetic enhancers (e.g. cobicistat) inhibit CYP3A4 activity leading to a decreased hepatic clearance and increased plasma concentration of the corticosteroid. A dose adjustment of the corticosteroid may be required (see Warnings and Precautions section). Concurrent administration of barbiturates, phenylbutazone, phenytoin, carbamazepine or rifampicin may induce the metabolism and reduce the effects of corticoids. Response to anticoagulants can be reduced or increased by corticoids. Therefore, coagulation should be monitored. Glucocorticoids may increase the requirements for insulin or oral hypoglycemic agents in diabetics. Combination of glucocorticosteroids with thiazid-diuretics increases the risk of glucose intolerance. Concurrent use of ulcerogenic drugs (e.g. salicylates, N.S.A.I.Ds) may increase the risk of gastrointestinal ulceration. Acetylsalicylic acid should be used cautiously in conjunction with glucocorticoids in hypoprothrombinemia. Convulsions have been reported with concurrent use of methylprednisolone and cyclosporin. Mutual inhibition of metabolism occurs with concurrent use of these two products. Therefore it is possible that convulsions and other adverse reactions associated with the individual use of these drugs may be more apt to occur. Concomitant administration of quinolones increases the risk for tendinitis. Concomitant use of cholinesterase inhibitors such as neostigmine or pyridostigmine can provoke a myasthenic crisis. Concomitant use of antihypertensives can lead to a partial loss of the hypertensive control because the mineralocorticoid effect of the corticosteroid can lead to raised blood pressure. The toxicity of heart glycosides and related products can be potentiated with concomitant use of corticosteroids, because the mineralocorticoid effect can induce potassium loss. Methotrexate can influence the effect of methylprednisolone by having a synergistic effect on the disease state. This may allow a reduced dose of corticosteroid. Methylprednisolone can partially suppress the effect of neuromuscular blocking agents such as pancuronium. Methylprednisolone can give an increased response to sympathicomimetic agents like salbutamol. This can lead to increased efficacy and potentially increased toxicity of the sympathicomimetic agents. Some animal studies have shown that corticosteroids when administered to the mother at high doses may cause fetal malformations. Since adequate human teratological studies have not been done with glucocorticoids, the use of these drugs in pregnancy, nursing mothers or women of childbearing potential, requires that the possible benefits of the drug be weighed against the potential risk to the mother and embryo or fetus. Glucocorticoids should be used during pregnancy only if clearly needed. If a long-term treatment with corticosteroids has to be stopped during pregnancy (as with other chronic treatments), this should occur gradually (see Dosage and Administration section). In some cases (e.g. substitution treatment of adrenocortical insufficiency) however, it can be necessary to continue treatment or even to increase dosage. Corticosteroids readily cross the placenta. Infants born of mothers who have received substantial doses of glucocorticoids during pregnancy, should be carefully observed and evaluated for signs of adrenal insufficiency. No effects on labor and delivery have been observed. Corticosteroids are excreted in breast milk. Although visual disorders belong to the rare adverse reactions, patients driving cars and/or using machines must be informed of these adverse reactions. Systemic adverse reactions may be observed. Although rarely occurring in very short term therapy, they should always be carefully traced. This is part of the follow-up of any corticotherapy, and does not specifically pertain to any particular product. In comparison with cortisone or hydrocortisone, mineralocorticoid effects are less likely to occur with synthetic derivatives such as methylprednisolone acetate. Sodium retention, fluid retention, congestive heart failure in susceptible patients, potassium loss, hypokalemic alkalosis, hypertension. Myocardial rupture following a myocardial infarction. Muscle weakness, steroid myopathy, osteoporosis, vertebral compression fractures, aseptic necrosis, pathologic fracture, tendon rupture, particularly of the Achilles tendon. Peptic ulceration with possible perforation and hemorrhage, gastric hemorrhage, pancreatitis, esophagitis, perforation of the bowel. A temporary and moderate increase of alkaline phosphatase levels can occur; but it is not associated with any clinical syndrome. Increase of liver enzymes (e.g. : SGOT, SGPT). The frequency of this effect is unknown. Impaired wound healing, thin fragile skin, petechiae and eccyhmoses. Increased intracranial pressure, pseudotumor cerebri, seizures. Psychic derangements may appear when glucocorticoids are used, ranging from euphoria, insomnia, mood swings, personality changes and severe depression to frank psychotic manifestations. Menstrual irregularities, development of Cushingoid syndrome, suppression of growth in children, suppression of pituitary-adrenal axis. Decreased carbohydrate tolerance, manifestations of latent diabetes mellitus, increased requirements for insulin or oral hypoglycemic agents in diabetics. Glucocorticoids should be used cautiously in patients with ocular herpes simplex or zoster associated with ocular symptoms for fear of corneal perforation. Increased intra-ocular pressure, exophthalmos, chorioretinopathy (frequency unknown). Negative nitrogen balance due to protein catabolism, epidural lipomatosis (frequency unknown). Masking of infections, latent infections becoming active, opportunistic infections, hypersensitivity reactions including anaphylaxis. May suppress reactions to skin tests. Persistent hiccups with high corticosteroid doses. Because of the resorption from the site of administration into the systemic circulation, sufficient attention is recommended for the above-mentioned systemic adverse reactions. In addition, in situ administration can cause dermal and subdermal atrophy. While crystals of corticosteroids in the dermis suppress inflammatory reactions, their presence may cause disintegration of the cellular elements and physiochemical changes in the ground substance of the connective tissue. The resulting dermal and/or subdermal changes may form depressions in the skin at the injection site. The degree to which this reaction occurs will vary with the amount of corticosteroids injected (see Warnings and Precautions section). Regeneration is usually complete within a few months or after all crystals of the corticosteroid have been absorbed. Rare instances of blindness associated with intralesional therapy around the face and head. Postinjection flare, following intra-synovial use. Injection site infections following non sterile technique. There is no clinical syndrome of acute overdose with methylprednisolone acetate. Repeated frequent doses (daily or several times per week) over a protracted period may result in a Cushingoid syndrome. EPIZOLONE-DEPOT is a sterile injectable suspension of the synthetic glucocorticoid methylprednisolone acetate. It has a strong and prolonged anti-inflammatory, immunosuppressive and anti-allergic activity. 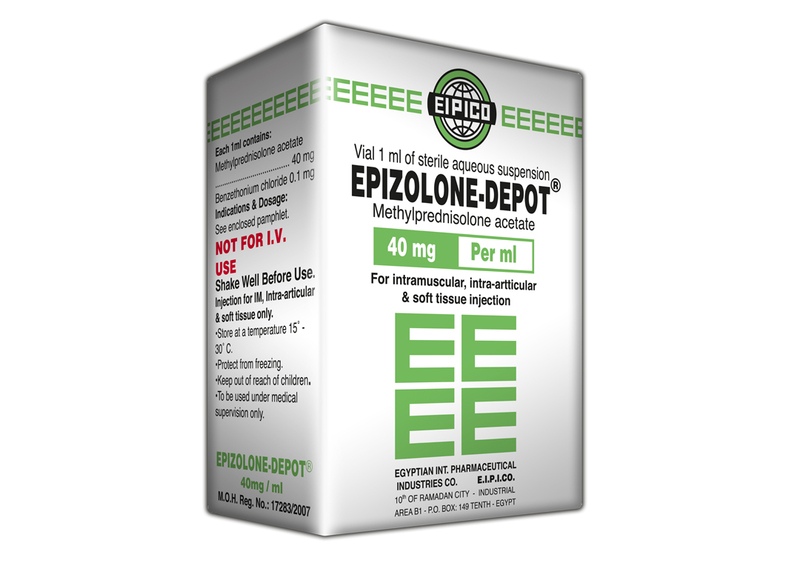 EPIZOLONE-DEPOT can be administered I.M. for a prolonged systemic activity, as well as in situ for a local treatment. The prolonged activity of EPIZOLONE-DEPOT is explained by the slower release of the active substance. Methylprednisolone acetate has the general properties of the glucocorticoid methylprednisolone but is less soluble and less readily metabolised, which explains its prolonged activity. Glucocorticoids diffuse across cell membranes and complex with specific cytoplasmic receptors. These complexes then enter the cell nucleus, bind to DNA (chromatin), and stimulate transcription of mRNA and of subsequent synthesis of proteins of various enzymes thought to be ultimately responsible for the numerous effects after systemic use of glucocorticoids. Glucocorticoids not only have an important influence on inflammatory and immune processes, but also affect the carbohydrate, protein and fat metabolism. They also act on the cardiovascular system, the skeletal muscles and the central nervous system. − reduced production of prostaglandins and related substances. A dose of 4.4 mg methylprednisolone acetate (4 mg methylprednisolone) has the same glucocorticoid (anti-inflammatory) effect as 20 mg hydrocortisone. Methylprednisolone has only a minimal mineralocorticoid effect (200 mg methylprednisolone are equivalent to 1 mg desoxycorticosterone). Glucocorticoids have a protein catabolic action. The liberated amino acids are converted into glucose and glycogen in the liver by means of the gluconeogenesis process. Glucose absorption in peripheral tissues decreases, which can lead to hyperglycemia and glucosuremia, especially in patients who are prone to diabetes. Glucocorticoids have a lipolytic action. This lipolytic activity mainly affects the limbs. They also have a lipogenetic effect which is most evident on chest, neck and head. All this leads to a redistribution of the fat deposits. Maximum pharmacologic activity of glucocorticoids is reached later than peak blood levels, suggesting that most effects of the drugs result from modification of enzyme activity rather than from direct actions by the drug. Methylprednisolone acetate is hydrolised to its active form by serum cholinesterases. In man, methylprednisolone forms a weak binding with albumin and transcortin. Approximately 40 - 90% of the drug is bound. The intracellular activity of glucocorticoids results in a clear difference between plasma half-life and pharmacological half-life. Pharmacological activity persists after measurable plasma levels have disappeared. The duration of anti-inflammatory activity of glucocorticoids approximately equals the duration of hypothalamic-pituitary-adrenal (HPA) axis suppression. I.M. injections of 40 mg/ml give after approximately 7.3 ± 1 hour (Tmax) methylprednisolone serum peaks of 1.48 ± 0.86 µg/100 ml (Cmax). The half-life is in this case, 69.3 hours. After a single I.M. injection of 40 - 80 mg methylprednisolone acetate, duration of HPA axis suppression ranged from 4 - 8 days. An intra-articular injection of 40 mg in both knees (total dose: 80 mg) gives after 4 - 8 hours methylprednisolone serum peaks of approximately 21.5 µg/100 ml. After intra-articular administration, methylprednisolone acetate diffuses from the joint into systemic circulation over approximately 7 days, as demonstrated by the duration of the HPA axis suppression and by the methylprednisolone serum values. Methylprednisolone is metabolized at hepatic level, qualitatively similarly to cortisol. The major metabolites are 20 beta-hydroxymethylprednisolone and 20 beta-hydroxy-6 alpha-methylprednisone. The metabolites are mainly excreted in the urine as glucuronides, sulfates and unconjugated compounds. These conjugation reactions occur principally in the liver and to some extent in the kidney. Store at (15°-30°C). Shake well before use. Protect from freezing. Do not use EPIZOLONE-DEPOT after the expiry date which is stated on the vial label after EXP. date:. The expiry date refers to the last day of that month. Throw away the syringe after use; do not use again. Epizolone-Depot 40 mg/1 ml Suspension for Injection (40 mg/ml): Box containing 1 vial of 1 ml.